Made for everyone living within Detroit and its surrounding populous This Cursed House, the debut LP from 7 southern michiganders with an obviously envious eye to the north, was recorded in the dark of winter on a sound board originally built and used in the early 80's to mix portions of 2nd & 3rd installments of the Star Wars trilogy. However, from the circuits of that nutorious beast of a board comes an unexpectedly warm record of art-folk arrangements featuring dual cellists, melodica, shout & response vocals, glockenspiel and rhodes piano. 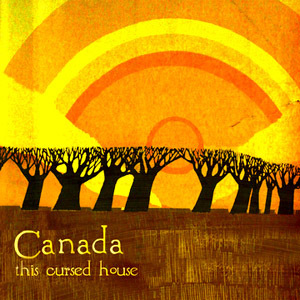 The band known as Canada has fast become the answer to the stuffy misaligned garage scene that has largely monopolized Detroit's weary image in the minds of the masses. THIS is what music from the mitten is about... it's the scene you should've been hearing from all along.